Printing parts with your 3D printer that feel and smell like wood? FilRight Designer WOOD makes it possible. This filament consists of a combination of PLA filament and wood fibers. By choosing different wood fibers, you determine yourself which wood type (s) and the color you are going to print. The 3D-printed object is therefore always unique and fully meets your needs. 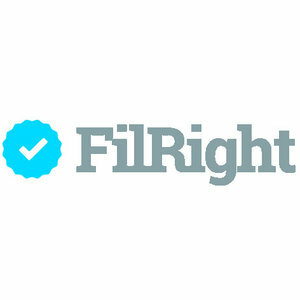 FilRight Designer WOOD filament is easy to use and completely biodegradable. FilRight Designer WOOD is delivered on a 500 gram spool. This filament is available in different colors and in both 1.75 and 2.85 mm diameters. Let us know if you are looking for other colors and/or spool sizes. These are available on request in most cases. FilRight Designer WOOD filament can be printed at a reasonably low temperature, namely between 205°C and 235°C. The use of a heatbed is required (recommended temperature between 40°C and 60°C). To avoid possible adhesion problems of the 3D prints and warping, we recommend that you always use an adhesive such as PrintaFix adhesive spray. A TDS is available for technical specifications regarding WOOD filament. Note: To print with FilRight Designer WOOD filament a nozzle with a minimum diameter of 0.4mm is required. WOOD filament - like all other FilRight filaments - is delivered on a transparent spool. This makes it always visible how much WOOD filament is left. The spool is completely sealed and packed in a cardboard box, so that any damage during transportation is prevented. Want to know more about FilRight Designer Wood filament? Then contact us.